NeoNickel > Unkategorisiert > Laser or Plasma Cutting? NeoNickel has been providing clients with a wide range of processing techniques and methods for over 30 years. Possessing a wealth of knowledge we are well known for our Laser and Plasma cutting services across Europe. Over the years we have invested heavily in the latest laser and plasma cutting technology, allowing us to offer outstanding products, at affordable prices. With a highly skilled workforce we have the capabilities in house to fulfill all our clients’ requirements. 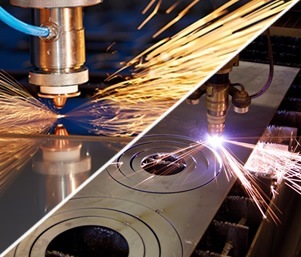 Laser and Plasma cutting allows us to produce parts to meet your demands, but what are the differences between the two processes? The process involves melting or vapourising the material before clearing the lasered area of molten material through the usage of gas. Our state of the art cutting facilities allow us to offer unbelievably accurate laser cutting services and unlike other machining services laser cutting is not affected by the hardness of a material. Laser cutting is extremely accurate and efficient at the same time. A high level of detail goes into each project and state of the art equipment produces consistent results time and time again. No matter what the material, laser cutting is perfect for the job. Supported by CAD/CAM technology our Plasma cutting equipment is second to none. The process works by sending an electric current through a gas that is passing through a constricted opening. The high-speed gas cuts through the molten metal, leading to a nice finish. 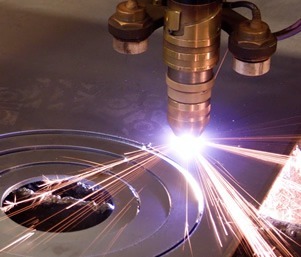 Plasma cutting can be used to cut through most metals. Like laser cutting, it is precise and the process is relatively quick. The overall finish is usually of a high standard. Although both processes are quick and efficient, Laser cutting is generally faster and more precise than Plasma cutting. Laser cutting can be used to cut a range of materials including woods and acrylics, while Plasma cutting is restricted to metals. 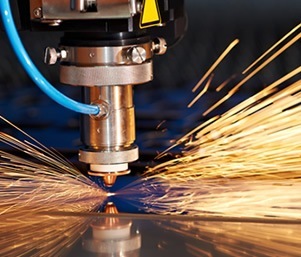 Industrial Laser cutters are not as efficient as Plasma cutters when cutting through thicker metal sheets, although the latter does use more energy. To summarise Plasma cutting is most commonly used for cutting steel while Laser cutting can be used to cut a host of materials. For more information on our Laser and Plasma Cutting services contact us or fill in our online quote form.